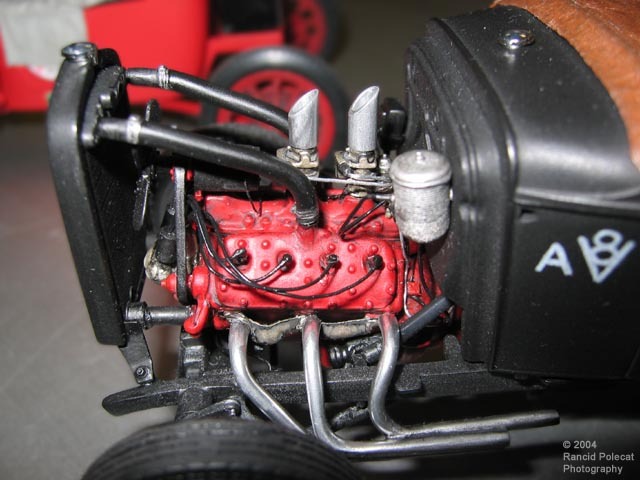 Steve sourced the engine from a Monogram 1937 Ford Pickup kit. Though it's mostly box stock, Steve modified it with a dual intake manifold and two stromberg 97 carbs from an AMT 1934 Ford five-window coupe kit, a pair of scratchbuilt aluminum stacks, and a set of cut-down and re-configured exhaust headers from a 1936 Plymouth modified kit. The beehive oil filter is an R&D Unique product and wiring is from Detail Master. The voltage box on the far side of the firewall is scratchbuilt.